I like to have decorations and things on my walls that mean something to me. 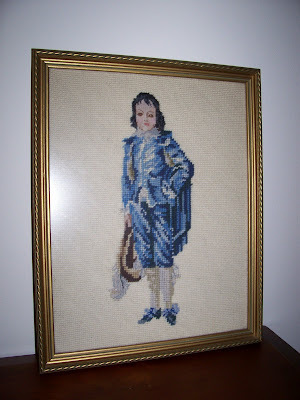 I have always liked this needle point that my great-grandmother had done and that my mom had stashed away in my closet. On a recent trip home I took it out and decided it would have a new home in my apartment. I love that on the back it says "Finished by Honey 1975" and also has the name of the framer she used which was in Brooklyn, NY. I never really knew exactly who the boy was, but just thought it was cool. 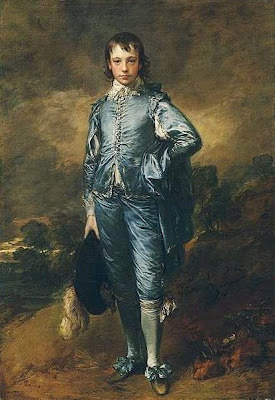 Well come to find out it is a pretty famous painting by Thomas Gainsborough in 1770 called "The Blue Boy".